You are greeted on arrival at Airport / Ernakulam Rly station and proceed to Guruvayoor (95kms), Guruvayur vibrates with the famous Guruvayupurrappan Temple, dedicated to Lord Krishna. Picturesque, peaceful and pious, the holy temple town is located in the Trichur district of Kerala. Guruvayoor is often called the Dwarka of South, and it is one of the most important pilgrim destinations of India. Later drive to Athirappally waterfalls. Overnight stay at Bethania resorts (Wonderful resorts for honeymoon people at Athirappally). After Complimentary Breakfast depart to Munnar (160 kms / 5 hrs) enjoying the scenic beauty & the marvelous waterfalls (Cheeyappara), high mountains with the low flying clouds passing by. You can do on the way sightseeing of Munnar and witness tea gardens spread like a green carpet over hundreds of kilometers, lush green hills, a place so difficult to describe, very low population too far from pollution, most of the area covered by Tata tea. Check in and evening relax at hotel. Overnight stay at Bell mount resort. After Complimentary Breakfast proceed for sightseeing in Munnar which includes Raja Malai, a top peak of Munnar where you may see Neel Thar (mountain goats), Pothamedu, Devikulam, Mattupetty, Eco-Point etc. You can also enjoy boating in the Lake (optional). Overnight stay in Bell mount Resort, Munnar. After Complimentary Breakfast depart to Thekkady covering a distance of 110 kms / 3.5 hrs through cardamom hills. Check into the Resort. After lunch visit spice plantation like cardamom, Pepper, Coffee, and tea estate etc. On way back to hotel you could stop at the local market and pick up some fragrant spices. Overnight stay at hotel Periyar Medows(Very close to Periyar tiger reserve) at Thekkady. 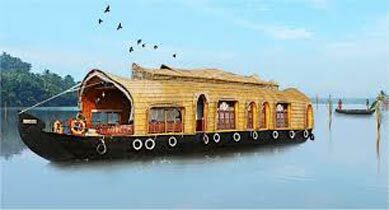 After Complimentary Breakfast depart for Alleppey covering a distance of 150 kms / 4.5 hrs and check-in into houseboat. Lunch, Evening snacks, Dinner and breakfast complementary at Houseboat. After lunch start cruise through paddy fields, coir making village and Overnight stay at Houseboat. 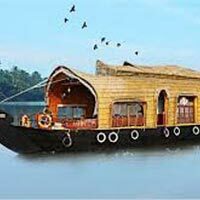 After check-out from houseboat at 09am and depart to Fort-Kochi, go for the sightseeing of Cochin. Here you can see the St Francis Church, the oldest Church in India, 500 year old Portuguese Houses, Cantilevered Chinese fishing nets, 16th century Synagogue, Jew Town and Mattancherry Palace, built by Portuguese, this Palace contains some of India's most beautiful murals. Evening go for shopping. Overnight stay at The Villa Romantica. Morning after complementary breakfast guests will transfer to Cochin Airport/Railway station.